Bavaria's magnificent castles, mysterious forests and magical mountains are the backdrop to this majestic tour, uncovering many hidden gems in the historic kingdom of Bavaria. Discover fairytale Neuschwanstein Castle and ride the Bavarian Zugspitz Mountain Railway, from a base in the charming village of Fussen. Meet a Great Rail representative at London's St Pancras International for the Eurostar service to Paris. Here, cross the city and catch the local train to Stuttgart for a night at the Maritim Hotel. This morning, journey via Ausburg to Füssen by rail, where you will spend the next two nights at the Luitpold Park Hotel. This afternoon you will enjoy an excursion to two of the finest Bavarian castles, beginning at honey coloured Hohenschwangau Castle before visiting glorious Neuschwanstein Castle. One of the most iconic examples of its kind, it was famously the inspiration for Walt Disney's Cinderalla Castle. Built into the mountains and standing proudly above the surrounding forests, its turrets and halls are resplendent white against a backdrop of green. Today you ascend the tallest mountain in Germany, the noble Zugspitze. To reach the summit, we first board the remarkable Zugspitze Railway, then the final leg of this journey is taken by cable car. On your descent back down, you stop at beautiful Lake Eibsee before returning to Füssen. Following breakfast, you drive to Munich for the train to Budapest. On arriving in Budapest, you will meet the Amadeus Queen and are welcomed with a cocktail in the lounge before dinner. Later take in the illuminated sights as you sail around the city. You are also treated to a performance from a local Hungarian folk band in the lounge. This morning, enjoy a guided coach tour, introducing you to Budapest's main sights. You will pass impressive buildings and monuments on both sides of the Danube, including the neo-Gothic Parliament building, the magnificent State Opera House and St Stephen's Basilica, Budapest Castle, Matthias Church and Fishermen's Bastion. 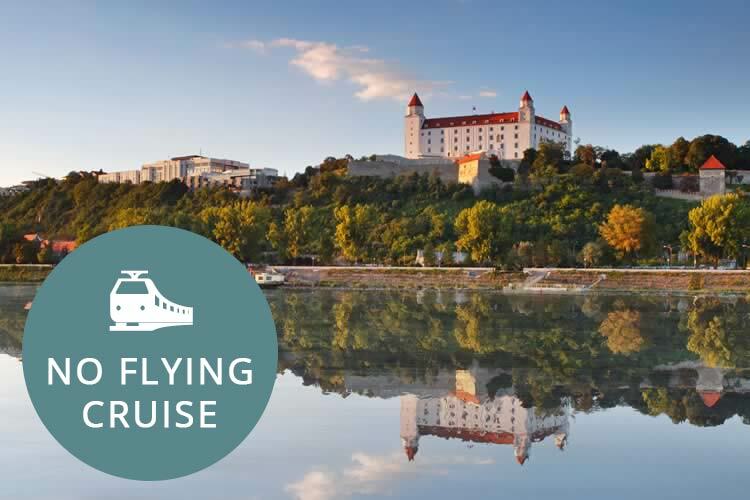 You will return to the ship for lunch, after which you have some free time before you begin cruising to Bratislava. Your departure time means you arrive at the scenic Danube Bend just as the sun sets. This section of the river has a long and fascinating history and from the sun deck or panoramic windows in the bar, you'll be able to see castle ruins, churches, pretty houses hidden in the hills and dense forests, all soaked in the golden glow of twilight. 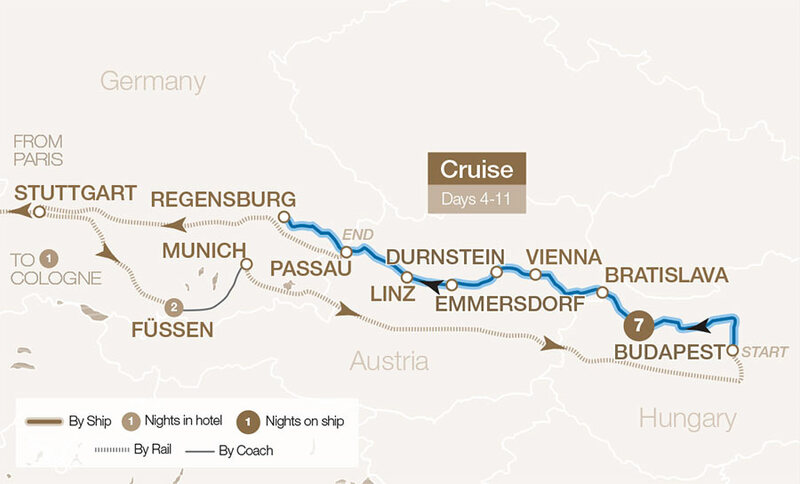 On Day 8 you disembark in Linz, where you have a choice of excursions. You could head further into the countryside for a day spent amidst the spectacular scenery of the Austrian lakes. Make stops in UNESCO listed Hallstatt, one of Austria's most photographed villages thanks to its traditional pastel-coloured houses perched on the tiny plain between the mountains and Hallstättersee Lake, as well as Mondsee. This pretty town is set on the lake of the same name, and its most famous sight is the 15th-century parish church, which featured in the wedding scenes of 'The Sound of Music'. On Day 11 you disembark after breakfast to start the journey back home via Cologne, where we spend the night. On Day 12 you complete your journey back to London.